If the Oakland Raiders really threw the match because of their white QB, it’s game over! If true, this would essentially mean that an NFL football game was illegally thrown over anger that one of the teams star white players did not believe that kneeling during the nation’s anthem was the correct way to protest supposed racial injustice in America. 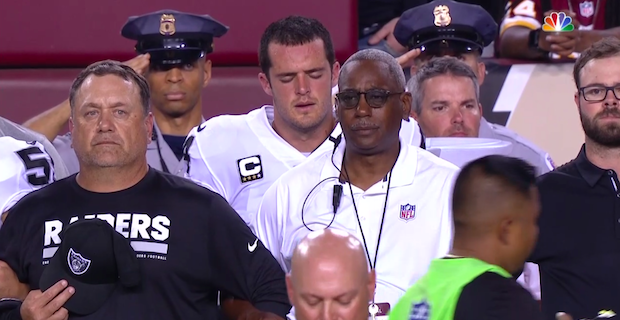 During the anthem, virtually the entire team was seen kneeling other than the teams coaches and star quarterback Derek Carr. Unfortunately, this may have not set well with the team’s offensive line as they were apparently the players who spearheaded the entire idea to kneel as a team in the first. “This is one hell of a scandal with the NFL, could ruin the whole league,” claimed the show before detailing the fact that Carr was sacked two times in a row on the teams second drive and that the team’s usually dependable center snapped the ball at the wrong time in three different instances. Extremely capable receivers also made multiple “weird” drops of passes thrown by Carr that T.V. announcers even noted at the time. The radio show then revealed bombshell “insider information” from an “extremely reliable” source who claimed that members of the Oakland Raiders did indeed throw the game as a sort of punishment for Carr choosing to not use the countries anthem to make a political statement. “He wants to stand alone, he can stand alone on the field,” one of the teams offensive lineman said, according to the shows source. Keep in mind, the offensive line are literally the guys whose job it is to protect the quarterback, in this case the star player who didn’t kneel. Amazingly, the circumstantial (and possible direct) proof didn’t end there as the show then claimed that this same source also revealed that a local team reporter got wind of the story and asked a team official for comment. What he was apparently told in response has all the hallmarks of a team trying to cover up a major scandal. “If you report on this, you will be blackballed, you will not get access to the Raiders period,” the reporter was supposedly told. “Your career covering the team will be over”. While there are obviously major legal and ethical issues if this is true, it also paints a sad picture of a football league divided by a political and media establishment all too happy to cause as much racial divide in the country as possible. For as long as Americans focus on differences between each other, the global elites power remains completely unthreatened. Authors Note: Its also important to consider that there is almost no chance that any member of the Raiders organization, whether coaches, the front office, or players (especially Carr himself) will publicly admit that this happened if it is indeed true. The sheer amount of mayhem it would cause is enough to keep almost anyone quiet. Anonymous player quotes and sources may be all we will ever have to go on.